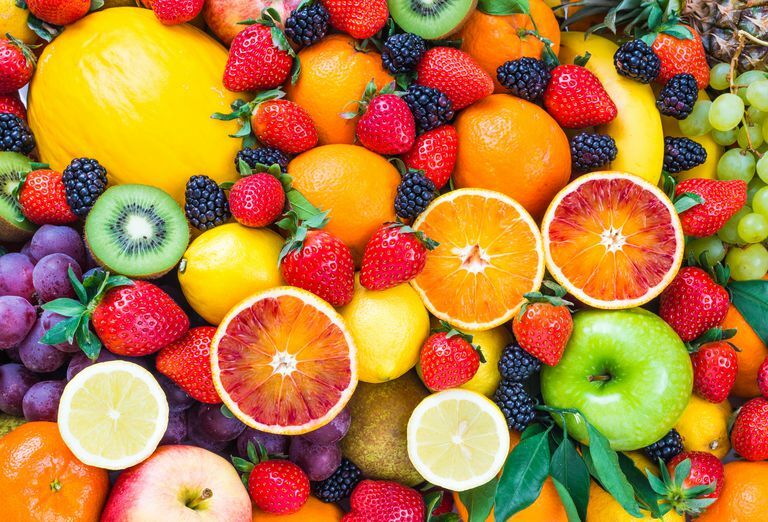 The jury is still out as to whether or not having several servings of fruit daily will help reduce the risk of breast cancer or fend off a recurrence. But, there is no doubt that fruit, especially fresh fruit, is good for your health. Loading up on enough fruits to have one and a half cups a day helps reduce your risk of chronic diseases and cancer, according to the USDA. Even more, a healthy diet that includes a rich selection of fruits and vegetables helps ward off heart disease, high blood pressure, type 2 diabetes, kidney stones, as well as cancers of the mouth, stomach, and colon. Experts tell us that choosing the fruits we eat can be simple and easy. Simply select a rainbow of colors. The deep colors in different fruits (as well as vegetables) are often conferred by the very compounds which may help fight cancer. Dietary fiber: Fresh and dried fruits are a good source of dietary fiber. While you're snacking on that apple-cranberry-banana salad, you're lowering your cholesterol, reducing your risk of heart disease, and keeping your digestive system happy. Fiber from fruit helps reduce constipation and diverticulosis while giving you that feeling of fullness that helps you cut down on overeating. Phenols: Peel an orange or squeeze a lemon and inhale the citrus aroma—phenols are aromatic compounds that occur in essential oils of fruits. The benefits don't stop at the great fragrance, though, because phenols have powerful antiseptic and antibacterial properties. These fragrant compounds can act as nerve stimulants and immune system stimulants. Antioxidants: Antioxidants are compounds that inhibit or reduce oxidative damage caused by free radicals, thus preventing some cell damage. Antioxidants can help promote good health for your heart, brain, and eyes by slowing the natural aging process. Folic acid: Folic acid, or folate, is necessary to the production of red blood cells, which carry oxygen throughout your body. These cells also remove waste products from your tissues. Premenopausal women and women who are in the first three months of pregnancy require an adequate supply of folate. Eating fruits and vegetables that are high in folate, or taking folic acid supplements, helps reduce your baby's risk of neural tube defects, spina bifida, and anencephaly as they develop in your womb. Potassium: You can take potassium as a supplement, but it's more fun to enjoy the taste of fruits that are high in potassium, such as bananas, prunes, dried peaches and apricots, cantaloupe, and honeydew melon. Prune juice and orange juice are also fine sources of potassium. These fruits may help keep your blood pressure in the healthy range. The electrolyte action of potassium helps keep your muscles healthy by maintaining good fluid levels and assisting with your metabolism. Vitamin C: Not just in oranges or other citrus fruits, vitamin C is important for all of your body tissues. Vitamin C assists with tissue growth and repair, helps heal cuts and wounds, and keeps your teeth and gums healthy. Phenolic effects: Natural phenolic compounds have been looked at with cancer for a long time both for their chemopreventive (cancer reduction) effects and for their chemotherapeutic (cancer treatment) effects. These compounds appear to have a direct effect on cell cycle progression, and several types of phenolic compounds have been found to inhibit the proliferation (growth) of some cancers. Antioxidant activity: Since oxidative stress can cause damage to genetic material in cells leading to the development of cancer, fruits with antioxidant activity likely play a role in reducing risk. Many studies have found that cancer risk is lower overall in people who consume more fruits. Since there are many different ways in which antioxidants work, we don't know exactly their role in cancer treatment at this time. Antiproliferative effects: Many fruits appear to have antiproliferative activity (inhibiting growth) against several types of cancer cells. To get the most cancer-fighting benefits from fruit, eat it fresh. It can be whole fruit or you can try sliced or chunked servings of fruit. Fresh fruits have the fullest health benefits, particularly from fiber. If you need something more convenient than fresh fruit, try pre-cut fruit that is packed in cans or jars without additional sugar. Dried fruits are portable and are available in a variety at most grocery stores. Frozen fruits can be kept on hand and used in smoothies, pies, or compotes. Pureed and juiced fruits, particularly canned and bottled juices, have little or no fiber, but are still beneficial. Jafari, S., Saeidnia, S., and M. Abdollahi. Role of Natural Phenolic Compounds in Cancer Chemoprevention Via Regulation of the Cell Cycle. Current Pharmaceutical Biotechnology. 2014. 15(4):409-21. Li, F., Li, S., Li, H. et al. Antiproliferative Activity of Peels, Pulps and Seeds of 61 Fruits. Journal of Functional Foods. 5(3):1298-1309.